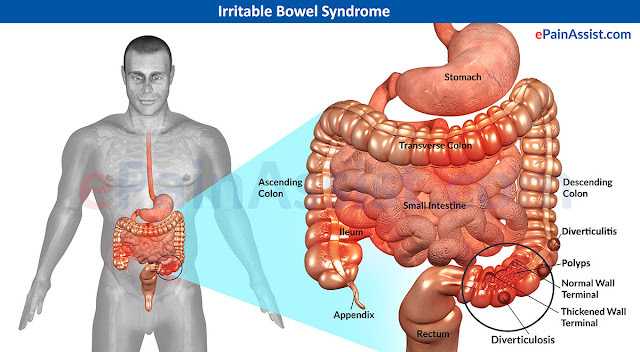 Irritable Bowel Syndrome (IBS) is defined as a functional bowel disorder in absence of structural pathology. (1) Psychological disturbances e.g. anxiety and somatisation are evident. (4) Luminal factors: eg. abnormality in gut flora. (long history with long symptom-free intervals). 1. Recurrent abdominal pain: it is classically situated in the left iliac fossa. 2. The pain is decreased by defecation or passing flatus. 3. There is constipation or diarrhea with feeling of incomplete evacuation. 4. The stools may be ribbon like with passage of mucus. 5. Abdominal distention is extremely common. 6. Abnormal stool passage e.g. straining or urgency. 7. Tenderness over the sigmoid colon. 8. Features of irritable person usually present. Abnormal stool frequency i.e. > 3/ day and < 3/ week. Abnormal stool form (hard, loose, watery, lumpy). - Poor sleeping and Fatigue. - Urinary symptoms e.g. frequency, urgency. disease, but to the irritable bowel syndrome. 1. Patients must be reassured of the benign nature of the condition. 2. A high fiber diet and bran are helpful. 3. Smooth muscle relaxants for pain e.g. Mebeverine. Chronic left iliac fossa pain. This is a full approach to treatment of Peptic ulcer including different types of drugs with doses and indications of surgical intervention . The aim of medical treatment is to relief pain, induce ulcer healing and to prevent recurrence and complications . - Soft bland diet. It is better to be small and frequent. - Avoid irritant foods and smoking. - Avoid excessive milk intake as it may increase acidity due to its calcium content. - Ranitidine (ZantaC®) 300 mg/D. - Famotidine (Antodine®) 20-40 mg/D . - for 4-8 weeks . - Omeprazole (LoseC®) 20 mg/D. - Pantoprazole (ControloC®) 40 mg/D. - Lanzoprazole (Lanzor®) 30 mg/D. - A proton pump inhibitor e.g omeprazole 20-40mg/D . - Also 2 antimicrobials are used; Metronidazole 400mgITIDplus amoxycillin 750mg rnD or clarithromycin 500mg/TID are used. Heli-cure is a drug in the market containing tinidazole, omeprazole and clarithromycine, it is given one tab/12hr for 2 weeks . 5. - Avoid NSAIDs, or use selective COX-2 inhibitors. This article to discuss the clinical picture of Peptic ulcer ( symptoms and signs ) , the routine investigations and complications in order to achieve a good approach to diagnosis of the disease. - Character :.burning, stabbing, or dull ache . - Site : patient points to the epigastrium . The patient can indicate its site with two or three fingers (the pointing sign). Back pain suggests penetrating ulcer . Duodenal ulcer: it is worse when the patient is hungry & at night. Gastric ulcer: It occurs 0.5-1 hr after meals . - Night pain : Pain wakes the patient from sleep suggests DU. Duodenal ulcer: Food, antacids and vomiting. 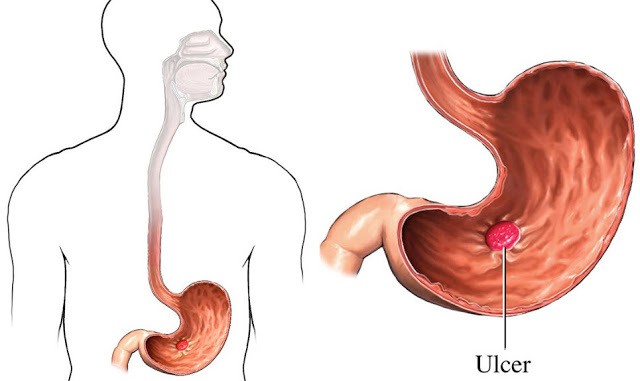 Gastric ulcer: fasting, antacids and vomiting. 2. Nausea : may accompany the pain. 3. Vomiting : It is infrequent but often relieves the pain. Some patients learn to induce vomiting for pain relief. - It may be manifested by hematemesis or melena. Also chronic undetected blood loss may occur leading to anemia. 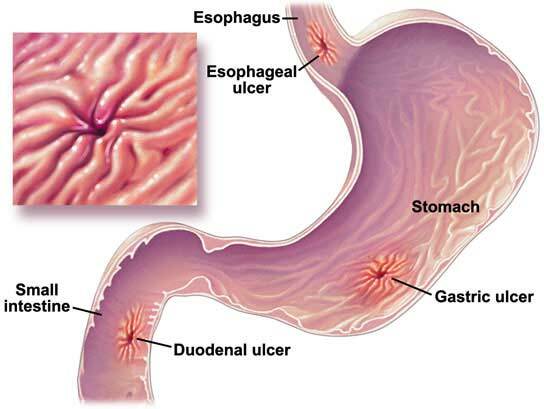 - Duodenal ulcer: It increases in most cases. Also the patient may identify the pain as hunger pain and obtains relief by eating, weight gain may occur. - Gastric ulcer: Patient suffers from sitophobia for fear of pain, weight loss may occur. 6. Heart burn : It occurs due to acid regurgitation. Water brash also may occur . This will occur especially in duodenal ulcer. The pain occurs in (on again/off again) episodes lasting 2-3 weeks at a time, three or four times in a year. Between episodes the patient feels well. In some patients the ulcer is completely silent, presenting for the first time with complication . Signs of peritonitis with perforation. - For exclusion of GERD or malignancy & to differentiate between benign & malignant gastric ulcers. - All gastric ulcers should be biopsied . Gastric ulcer : Ulcer niche on the lesser curvature with serial films.Notch on the greater curvature opposite the niche . Duodenal ulcer :deformity of the duodenal cap with serial films. 1. Serum antibodies: detect IgG antibodies (sensitive and specific) but are not useful for eradication. 2. Urease test: biopsies are added to a urea solution; in positive cases the urease splits urea to release ammonia giving color change in the indicator, as ammonia raises the pH of the solution . 3. Culture: biopsies obtained can be cultured. 4. Histology: H. pylori can be detected histologically by (Giemsa) stained sections of gastric mucosa obtained by biopsy. Non invasive method to diagnose H. pylori is 13C urea breath test by measuring of 13CO2.in the breath after ingestion of C13 urea. It is a quick, easy screening test. 1. Hemorrhage, hematemesis, melena or anemia . - a) Gastric outlet obstruction. b) Hour-glass stomach. This causes generalized peritonitis, or subphrenic abscess. Plain chest X ray showing pneumoperitoneum. 4. Penetration : Pain usually is sudden and radiates to the back, with rise of serum amylase. - HCI is secreted in the stomach by the parietal cells through the action of the Hydrogen-potassium ATPase (proton pump). - Secretion of HCI is under neural and hormonal control. Both stimulate acid secretion through the direct release of histamine stimulating the parietal cells. Acetylcholine and gastrin also release histamine. - Somatostatin inhibits both histamine and gastrin release decreasing acid secretion. - Gastrin is secreted by G cells in the antrum, it stimulates HCI secretion. It is an ulcer in the duodenum, stomach, lower esophagus or in the Jejunum after gastrojejunostomy with exposure to acid-peptic juices with a defect in the mucosa that extends through the muscularis mucosa into the submucosa or deeper. H. pylori is a spiral-shaped, gram negative, urease producing organism. The organism is found under the mucus layers in close to gastric epithelial cells. It is transmitted by faeco-oral or oral-oral (saliva) routes. 30-60% of western populations are affected and the prevalence is higher in underdeveloped countries. The older populations are more liable. An alteration in the mucus protective layer. Decrease in somatostatin from the antral cells (somatostatin inhibits both histamine and gastrin release). The organism produces urease enzyme. which splits urea producing ammonia which raises the pH around it to protect itself. Prostaglandins have important several mechanisms to protect gastric mucosa. They stimulate bicarbonate & mucus secretion from the gastric mucosa. Also they increase the microvasculature of the mucosa. All these mechanisms are called the mucosal barrier. NSAIDs act by inhibiting cyclo-oxygenase enzyme (COX) leading to decrease prostaglandins at the site of inflammation. NSAIDs decrease gastric and duodenal prostaglandins, so mucosal erosions & ulcerations will occur. The cyclo-oxygenase enzyme (COX) has 2 types, COX-2, which is present at sites of inflammation and COX-1, which is present in the stomach.So COX-2 inhibitors will not affect the gastrointestinal mucosa . 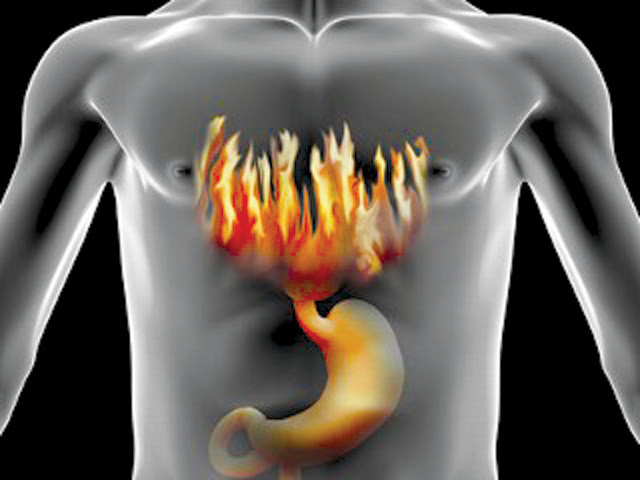 Reflux is responsible for ulcers at lower esophagus. Peptic ulcer (PU) is more common in men than women . Familial incidence especially in duodenal ulcer (DU). Peptic ulcer is more common with blood group O . These are two known esophageal diseases . What is meant by esophageal globus ? - It is persistent or intermittent sensation of a lump or foreign body in the throat, this sensation is present between meals. Absence of dysphagia on swallowing. - In the majority, it is probably a functional disease . - It is treated by reassurance with anti-reflux therapy. What is Mallory Weiss syndrome ? - It is a linear mucosal tear at the esophageo-gastric junction produced by a sudden increase in the intra-abdominal pressure. - It usually occurs after a bout of coughing, retching or after an alcohol binge. - It is diagnosed by endoscopy. - The hemorrhage stops spontaneously. Rarely surgery with oversewing of the tear may be required. Chest pain is one of the common symptoms of both Myocardial ischemia and Gastro-esophageal reflux disease (GERD) , and here , we are going to discuss the difference between both cases . Burning pain produced by bending, stooping or lying down. Pain seldom radiates to the arm. Pain precipitated by drinking hot liquids or alcohol . Relieved by antacid, and aggravated by nitrates. Pain radiates into neck, shoulder and both arms. Relieved by rest and nitrates. Reflux of gastric contents into the esophagus which allows prolonged contact of these contents with the lower esophageal mucosa. It is the most common disorder of the esophagus. 1. The resting lower esophageal sphincter (LOS) is low and fails to increase when lying flat . 2. Decrease esophageal clearance of acid due to poor esophageal peristalsis. 4. 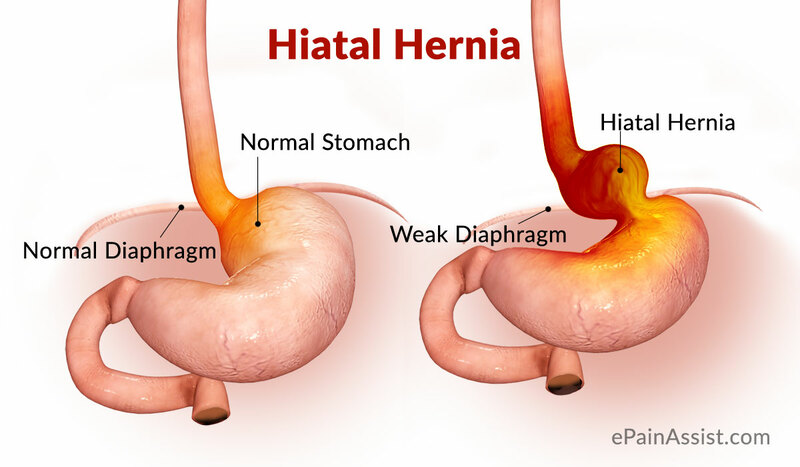 Hiatus hernia may impair the pinchcock mechanism of the diaphragm. 5. The lower esophageal sphincter tone fails to increase when intra abdominal pressure is increased by tight clothes or pregnancy . How to diagnose GERD ? 1. Heart burn: It is the most cardinal symptom of GERD, it is due to direct stimulation of the hypersensitive esophageal mucosa. 2. Chest pain: similar to angina (due to reflux or esophageal spasm). 4. Dysphagia: due to disturbed motility or structure. 5. GIT bleeding, Iron deficiency anaemia (esophagitis). 6. Pulmonary: cough, aspiration pneumonia may occur. GERD is a clinical diagnosis and many patients can be treated without investigations . - Endoscopy. to confirm the presence of esophagitis. - 24 hour intra-luminal pH monitoring of the esophagus. - Barium study: It may show a hiatus hernia. 3. Barrett's esophagus: columnar metaplasia of the lower esophagus.It is a premalignant leading to adenocarcinoma. - Cessation of smoking, loss of weight and simple antacids. - Avoid alcohol, fatty meals & drugs e.g. nitrates. - Avoid heavy meals especially before sleep. - Raising the head of the bed at night. - Avoid any other precipitating factor. Prolonged therapy is usually needed . - Antacids: Mg trisilicate and aluminium hydroxide, also alginate containing antacids forming a gel with gastric contents reducing reflux. - H2 blockers: Ranitidine (Zantac (300mg at bed time) . - Proton pump inhibitors: Omeprazole (20-40mg/day),Lanzoprazole (30mg/day) or pantoprazole (20- 40mg/day). They inhibit the gastric hydrogen-potassium ATPase . - Cisapride (Prepulsid): not available now!? It leads to arrythmia. for severe cases with repair of hernia if present. The gastric fundus is warraped around the abdominal oesophagus. 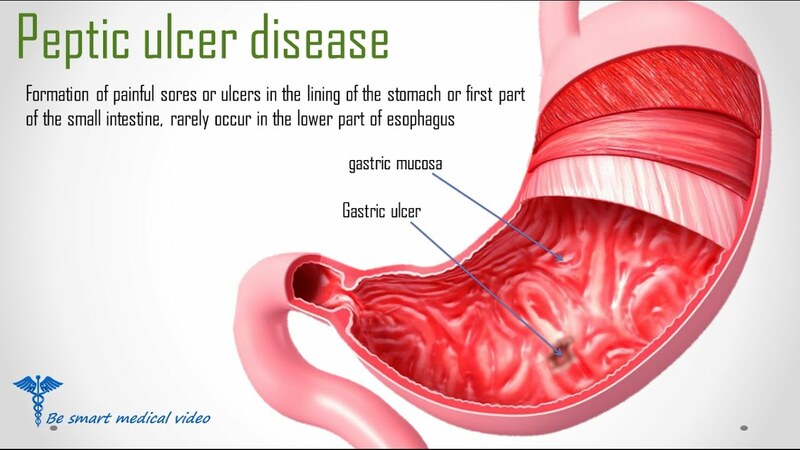 Cancer esophagus is one of the most lethal of all cancers (Carcinoma of the esophagus) . It is more common in old males (60-70 years). Smoking, alcohol, achalasia or reflux and Barrett's esophagus. i.e. columner metaplasia of the lower esophagus . Tylosis (hereditary disorder of squamous epithelium) with hyperkerosis of palms and soles. - Macroscopically: The lesion is usually ulcerative & it extends around the wall of the esophagus, causing narrowing. Spread: Direct, haematogenous or through lymphatics. How to diagnose Esophageal carcinoma ? - Progressive dysphagia, first to solids and eventually to fluids. Weight loss, due to dysphagia and anorexia. 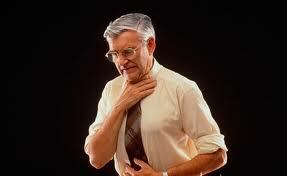 Late the esophageal obstruction causes difficulty in swallowing and coughing with pulmonary aspiration. 1. Barium swallow: - Irregular filling defect with shouldering sign. - Rat-tail appearance may occur. 3- CT scan of chest & abdomen for size of the tumor & spread outside the esophagus. A. Surgical resection: If the tumor has not infiltrated outside the esophageal wall followed by chemotherapy and radiation, but unfortunately most patients presented late. 1. Radiotherapy is limited for squamous cell carcinoma of the upper and middle third. 2. Chemotherapy (5-fluouracil and cisplatin) can be used with radiotherapy. 3. Palliative maneuvers: stent application or by-pass operation to allow fluids and soft food to be eaten or local destruction of the tumour by laser. It is a motility disorder of the esophagus characterized by failure of relaxation of the lower esophageal sphincter with aperistalsis in the body of the esophagus (atony). 1) Degeneration in the myenteric nerve plexus of the esophageal wall. 2) Lesion in the nitric oxide containing neurons. How to diagnose Esophageal achalasia ? (The disease is more common in middle-aged females). - Intermittent dysphagia to fluids &to solid foods. - Retrosternal chest pain occurs with vigorous non peristaltic contraction of the esophagus . - Putrefaction of the retained food leads to halitosis. - Chest infections may occur due to aspiration during sleep, due to regurgitation. - Weight loss is usually not marked. 1. Chest x ray showing: Absence of gases in the fundus of the stomach. For diagnosis & to exclude cancer esophagus in achalasia the endoscope can pass easily through the narrowing without resistance. 4. Manometry: It shows aperistalsis with failure of the lower esophageal sphincter to relax. How to manage a case of Esophageal achalasia ? 1. The treatment of choice is endoscopic dilatation. 2. Endoscopic botulinum toxin injection in the lower esophageal sphincter. 3. Laparoscopic cardiomyotomy if these measures fail (Heller's operation). i.e. division of the muscle at the lower end of the oesophagus, it can be done laparoscopically. 4. In old age Ca Ch blockers (Nifedipine) can be tried initially. This describes the herniation of a part of the stomach into the chest. There is herniation of the gastro-esophageal junction through the esophageal hiatus in the diaphragm into the thorax. This will affect the valvular mechanism of the gastro-esophageal junction leading to reflux of gastric contents into the esophagus. Heart burn (Pyrosis): It is a burning retrosternal pain occurring in lying down Qr leaning forward, it is severe during sleep. Dysphagia may occur due to esophageal stricture. Bleeding e.g. haematemesis, melena or presented with iron deficiency anemia due to esophagitis. Weight reduction, also meals should be small. H2 blockers and proton. pump inhibitors. Prokinetic drug: Domperidone (motilium) . Indicated in resistant cases, (fundoplication) . A small part of the fundus of the stomach rolls up alongside the esophagus through the hiatus. The gastro-esophageal junction remains in normal position, so there is no reflux. It may lead to mediastinal syndrome if severe. Also gastric volvulous or strangulation may occur. Surgery is indicated in severe cases. The esophagus is a hallow muscular tube, about 25 cm long connecting the pharynx to the stomach, it has no significant absorption or secretory function. It is lined by stratified squamous epithelium except near the gastro- esophageal junction lined by columnar epithelium. The esophagus is separated from the pharynx by the upper esophageal sphincter (UES) which is normally closed by the cricopharyngeus muscle contraction . The lower esophageal sphincter (LOS) consists of an area of the distal end of the esophagus with a high resting tone to prevent reflux . The relaxation and reduction of LOS tone that occurs during swallowing is under the control of vagus and other hormonal mechanisms. The presynaptic neurotransmitter is acetylcholine. The postsynaptic neurotransmitters which cause relaxation are nitric oxide and vasoactive intestinal peptide. The act of swallowing begins with propulsion of the chewed bolus into the posterior oropharynx by the tongue. - The soft palate elevates to close the nasopharynx . - The epiglottis close over the larynx . - The UES relaxes . - The pharyngeal constrictors contract to propel the bolus into the eosophagus . Here is a list of the diseases that affect the salivary glands, with definition, causes and management of each . - It is Excessive salivation . - Secondary to oral pathology e.g. stomatitis. - It is dryness of the mouth . - Drugs e.g. anticholinergics and antihistaminics. - It is inflammation of the salivary glands . - Acute sialadenitis may be due to mumps (parotitis) or bacteria. - These occur occasionally in the submandibular gland or its ducts. Painful swelling of the submandibular gland after eating. Stones can sometimes be felt in the floor of the mouth. Sialography and Plain X-ray will show the stone. - The majority occur in the parotid gland. - The pleomorphic adenoma is the commonest which may turn malignant. - Malignant tumors usually result in lower motor neurone lesion of facial nerve. Sarcoidosis can involve salivary gland. e.g. in cases of Heerfordt's and Mikulicz syndromes . This is a list of the different types of diseases that affect the tongue. - It may be involved in stomatitis due to nutritional deficiency. It is a chronic lesion (White, firm smooth patches). It usually starts at the side of the tongue. Early it is not painful but later become tender. It is associated with alcohol and smoking. It may precede the development of carcinoma. Isotretinoin may reduce disease progression. It is due to proliferation of chromogenic microorganisms causing brown staining of elongated filiform papillae. It is of Unknown etiology . Glossodynia (painful tongue) and glossopyrosis (burning sensation in the tongue) if the tongue looks normal the cause may be depression. Bad taste in the mouth is sometimes due to drugs or sinusitis but it may reflect anxiety or depression. of oral hygiene may lead to bacterial proliferation causing stomatitis. - Stomatitis may also occur when resistance to the commensal population is lowered e.g. in the immune-compromised host. - Stomatitis may also occur due to nutritional deficiency. What is meant by stomatitis ? It is inflammation of the mucous lining of any of the structures in the mouth, which may involve the gums,cheeks, tongue, lips, and roof or floor of the mouth . - It occurs in adults with malnutrition and poor dental hygiene. - There are ulcers on the gum, palate, lips and the inner aspects of cheeks. - Halitosis ( odor from the mouth ) . - A stained smear shows spirochetes and fusiform bacilli. - Metronidazole or penicillin . - Herpes simplex may cause herpes labial is in normal persons. - It can lead to severe stomatitis in immune-compromised patients. - Coxsackie virus causes herpangina with acute pharyngitis, ulcers of the soft palate and pharyngeal mucosa. - The fungus candida albicans is a normal commensal in the mouth. It may proliferate to cause thrush in babies and in debilitated patients. - Also thrush is common in patients receiving prolonged treatment with antibiotics and in patients who are immunosuppressed by corticosteroids or AIDs. 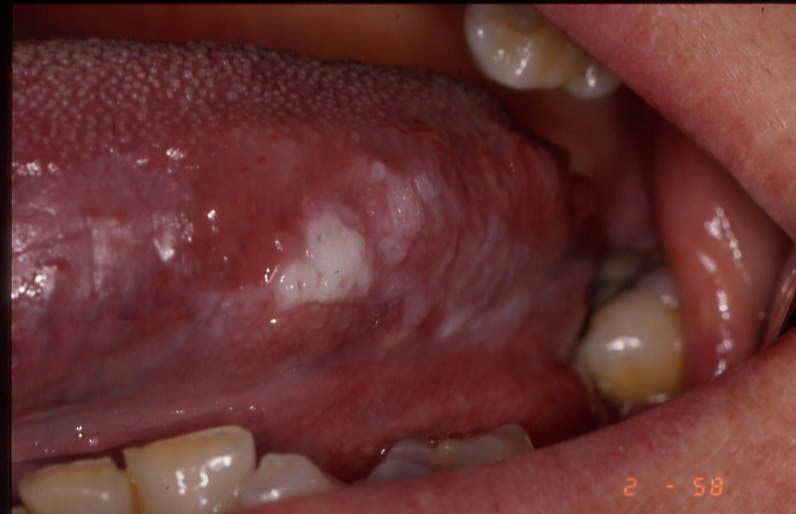 - White patches on the tongue and buccal mucosa. - In severe infection the pharynx and esophagus can be affected causing dysphagia . Treatment of the cause . Lozenges or suspension of nystatin. . Systemic antifungal in severe infection. - This occurs due to deficiency of niacin, riboflavin, folic acid and vitamin B12. - When the deficiency is acute and severe the tongue is red and painful because of atrophy of the papilla . - Angular stomatitis often accompanies glossitis especially in severe riboflavin and iron deficiency. What is Angular Chelitis (Angular stomatitis ) ? It is erythema or crusting of the labial angles. It is also caused by candida. It is associated with.intraoral candidasis. It is treated with topical with or without systemic. antifungal drugs, iron and vitamin supplements. What does Chelitis mean ? Painful vertical fissures mainly of lower lip caused by malnutrition. It may occur in crohn's disease or with·exposure to sunlight and wind . - It affects 20% of population . - Emotional stress may precipitate the attack. - May occur during the premenstrual phase. - May occur in association with Crohn's disease, ulcerative colitis or Behcet's disease. - Nutritional deficiencies with or without GI disorders are occasionally found. - The ulcers are recurrent at intervals of days to a few months. - Multiple shallow rounded ulcers, they are PAINFUL . - Minor ophthous ulcers are < 10mm with grey white center with thin erythematous halo and heal with 14 days without scarring . - Hydrocortisone hemisuccinate lozenges . - To ical anesthetics . In this article, we are going to discuss Intussusception which is a serious disorder and it can cause intestinal obstruction with its known complications. We are going to discuss the definition, aetiology (causes), pathology, clinical picture (symptoms and signs), investigations, differential diagnosis, and treatment (management) of Intussusception . 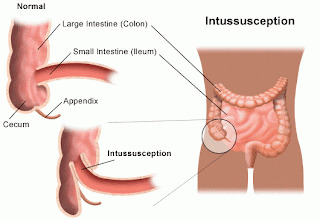 What is meant by Intussusception ? Definition: One portion of gut becomes invaginated into another immediately adjacent portion . 2. Infant between 6th – 7th months. · The intussusception is made up of: Entering layer, Returning layer, Outer sheath, Apex., Base. · The apex is the part which advances. · The base of the sheath will contract on the intussusceptum constricting its lumen & its mesenteric vessels. Here is an approach to diagnosis of acute intestinal obstruction in which, we are going to discuss the symptoms, signs and diagnostic investigations of I.O . : Characterized by Pain, Vomiting & Absolute constipation. Here we will discuss the definition and causes of Dysphagia which is a common GIT symptom . 3. Neoplasm of Tongue & Cheek. What is Peptic Ulcer ? It is ulceration of mucosa bathed in gastric juice. Where does Peptic Ulcer occur ? Site : A- Duodenum à (commonest). C- Rarely in: Jejunum, Esophagus, Mickle’s diverticulum . What are the Causes and predisposing factors of Peptic Ulcer ? This is a brief review of Tuberculous Peritonitis , which is a serious medical case that results in many serious complications . Here , we will discuss the Aetiology , Pathology , Diagnosis and management of the disease , so let's start . - Age: usually 5-20 years. -- Secondary to: Tuberculous mesenteric LNs, tuberculous ente . tuberculosis of fallopian tubes or pulmonary tuberculosis. -- Primary (Rare): Occurs in children taking infected milk.